I used to think that there wasn’t anything you could do to improve upon spaghetti carbonara. It was already so perfect – a creamy sauce of pancetta, Parmesan, and silky eggs that gently coated each spaghetti noodle. How could you possibly make that any better? With the discovery of this recipe, I found my answer – add crab and Meyer lemons. That’s how. Seafood and lemons have always been a winning combination but when the lemons happen to be Meyer lemons, the flavor is a show stopper. Meyer lemons impart a fragrant lemon taste without a hint of tartness. It’s just the thing to complement the crab. The fact that these Meyer lemons happen to come from my sister’s tree makes them extra special. The sweet flavor of Meyer lemons plays a big part in this recipe. So, I would not recommend substituting regular lemons for the Meyer lemons here. Not to mention the bright orange-yellow zest adds beautiful color to the final dish. Heat olive oil in a skillet over medium heat. When oil is shimmering, add pancetta and cook, stirring occasionally, until beginning to brown, about 5 minutes. Add the shallots and garlic and sauté until the shallots are golden brown, about 5 minutes more. Remove from heat. Set aside. In a large bowl, whisk together the eggs, Parmesan cheese, parsley, salt, and pepper. Add the pancetta mixture and whisk together. Add the Meyer lemon zest and juice. Whisk to combine. Gently stir in the crab. Set aside. Bring a large pot of salted water to a boil. Cook the pasta until al dente. Drain and immediately add the hot pasta to the egg and crab mixture. Add the butter, then toss the pasta quickly and thoroughly to make sure all of the strands are coated and that the ingredients are well mixed. To serve, divide the pasta among four plates and sprinkle with toasted bread crumbs and chopped parsley. Use freshly grated parmesan cheese rather than pre-grated. Pre-grated cheese is usually coated in something to prevent clumping (like cellulose powder) which will keep the cheese from melting smoothly. Recipe from James Beard Foundation. This is amazing looking! The pictures are scrumptious looking and the pairing of crab & lemon is so classic (and with good reason!). Well done! Thanks, Jessie. It really is a delicious recipe. I think I ate almost the entire pan myself! Love how you made this spaghetti look so light and “springy!! Gorgeous photos! Thank you!! It was a beautiful sunny day when I made this dish which really helped make the photographs look good. I am in love with this! I want to reach through the screen and grab a plate :). It looks so so sooo yummy. Thanks, Annie. Your comment made my day! Look at that! 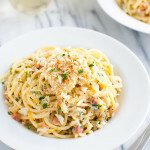 It’s my all time favourite pasta stepped up with CRAB and Meyer lemons!! Wow! I love your photos! They are so bright and crispy. I especially love the twirling pasta shot! Thank you for your sweet comment, Nagi. Being a huge admirer of your photography, your compliment means a lot to me.